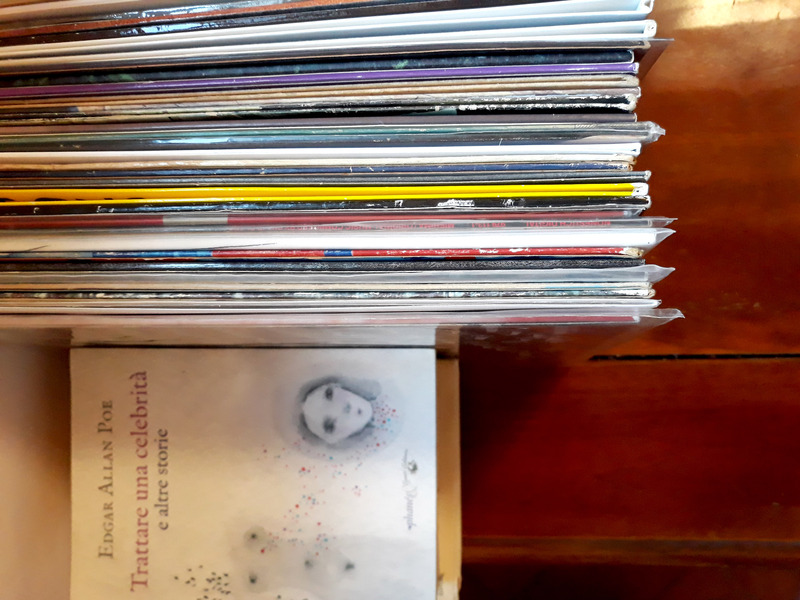 Connections among different forms of art: that’s what seems to emerge from what I see, from the DVD of Michel Gondry to the ‘physical’ mixture in placing records and books together. As far as I know one of your main interest is to cross or even destroy borders between different art forms (if art can be sliced into forms). I was born in the centre of Italy, and I grew up travelling from a place to another – because of the job of my dad – from the deep south to the north east, and then on my own to other states and to north west Italy. I think to be myself the result of a mixture of disciplines and interests, beside a mixture of cultures, attitudes and influences. This was first of all my way of looking at different things, of considering what surrounded me and then to create too. The sense of partiality, meant as the difference that identify anyone, has always been a fundamental part of my qualities. Feeling everywhere as the outsider, ‘the stranger’, was probably one of the essential elements also in my way of shaping things. I was part of every community I met, but at the same time I didn’t belong there. So I think I just didn’t feel borders, perimeters, lines that define, as something that matters. 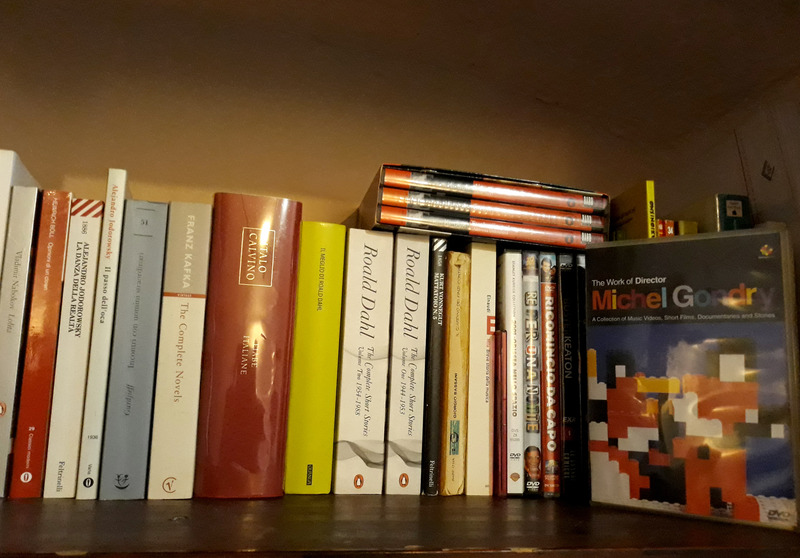 Then, to say it right out of the gate, the actual mixture of the few books and records I actually have with me, is also due to the space I live in now, and after moving house for 12 times in all my life I had to make selections (add also some randomness). The big amount of my stuff is at my parents’ house. To say it with George Carlin, the whole meaning of life seems to try and find a place for your stuff. Ovidio’s “Metamorphosis” not far from your own books… I suppose that this concept of changes of the body shape and its connection with what surrounds it is one of your focus in your work. Even Barbapapà can be inscribed in this selection! Ovidio’s books, and Apollodoro as well, are with me since when I discovered and started to love mythology, and philosophy. 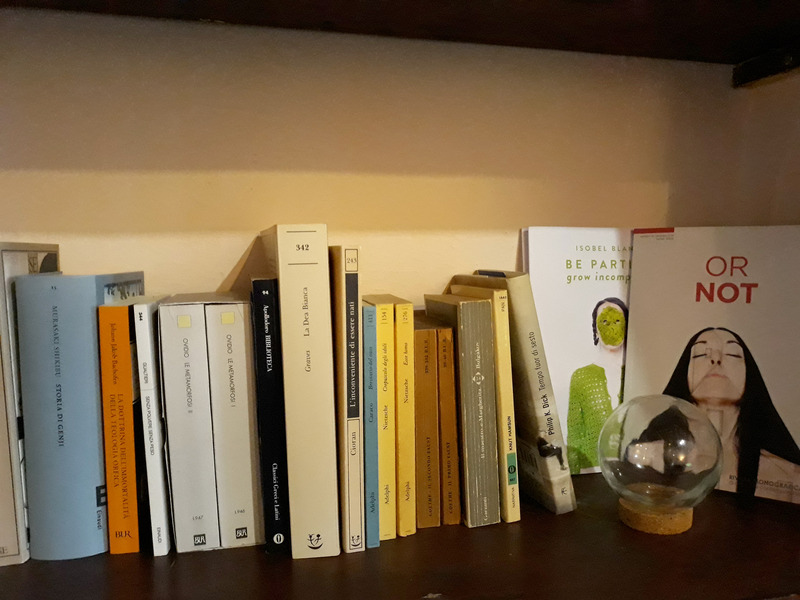 Seeing them beside my own monograph is someway a profane juxtaposition but surely could also have a value, because myth in general has greatly affected and influenced my way of thinking. Of course the concept of transformation, intended both as a mimesis with what’s around me or, at the opposite, to detach and distinguish myself from it, is someway one of the topics of my work, especially if we talk about my performances, photography and videoart. In my work I’m almost always dealing with a domestic space, that for me, not having a sense of belonging to a particular house, is a sort of neutral container that could potentially become everything my imagination can visualize. Like white clay in my hands. My longstanding study and devotion to dance complete the scene in the moulding of the shapes that my body assumes on the different backgrounds. I love Barbapapà, a leftover from my childhood from which I do not willingly separate myself, and that could definitely be included in the selection. 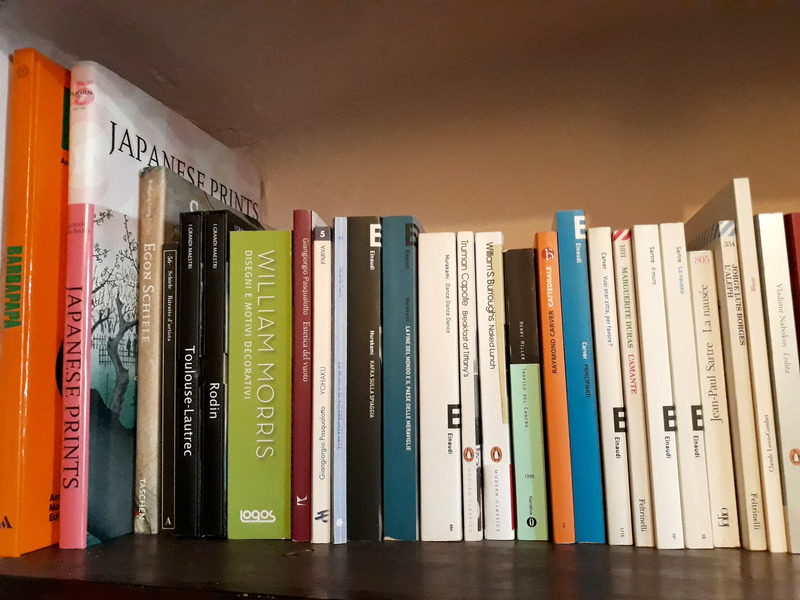 It stands close to my Japanese prints book, and I guess that this underlines the dichotomy that perfectly represents me. I’m fond of illustration, comics, and children books. I actually worked in those fields for a while, illustrating for children books for some years and also collaborating with Frigidaire, a mythical magazine, in several occasions. I deeply love childhood books because I always enjoyed the many levels of reading they hide. There you can see “The NeverEnding Story”, “His Dark Materials”, and both of them explore fundamental themes of philosophy together with spirituality in a very delicate and tactful way. Focusing on what you were asking though, I think that Roald Dahl’s “Short Stories” are what better represents the fusion that you noticed among something tender and at the same time a bit disturbing. In these collections, which are not properly intended for children, you may find the childish attitude he is best known for, being overshadowed by creepy and grotesque scenarios. I feel his blending of these two sides as one of the most representative, and I think my work partecipate of that ambiguous duplicity too. That’s why my wool sculptures are hybrids so soft and tender in joining humans and beasts, and I guess that’s why my illustrations also fit in describing Edgar Allan Poe tales, as occurred for a publication a few years ago. Amazing, I din’t notice Philip Pullman “His Dark Materials”, a recent discovery for me that actually brought me deeply into this sort of ‘much more than fantasy’ books. These are – for me – very intelligent explorations of philosophy and even teology themes, a way to push the reader to see the world(s) from different perspectives. Can I daresay that you somehow work in a similar direction? You said you lived here and there, your house is not really a home, and when I see for example your photos I feel a sense of ‘second layer displacement’, like if the image is quite ‘normal’ in a way, but has something weird, unusual, otherwordly. I learned one of the first things about philosophy at its very beginning as a discipline, precisely when Plato talked about it (Teeteto, 155d), saying that the birth of thinking lays in looking at everything’s usual as if it was the most unusual. “Thaumazein” – the astonishment for what is more obvious – is the beginning of philosophy, of thought, and being astonished by the obvious is the most typical feature of a thinker. I guess that this is my way to look at ‘normal’, everyday things and domestic spaces, as if they were something unexpected, uncommon. Maybe my point of view finds its roots in these learnings, or simply recognizes its natural instinct in these knowledges. In my first selfportrait I was 14, had no idea of philosophy but I had an analogical camera and I was arising upside down from the bottom of my desk, in my room. And then, a few words about music and records: I see your own, mainly, LP. Can you tell me about it, the way the music was developed, and how is it going in terms of reviews, feedback, etc…? Ask The White exists from about 2/3 years in its live touring experience, “Sum and subtraction” was born because people kept asking us if we had something recorded of what they listened to during the shows. So the LP has a really natural, spontaneous genesis and was released in october 2018. Me and Simone Lanari recorded everything in our living room, in front of our fireplace, with just one microphone, and despite the few means, we’re very happy about the final work and the feedbacks as well. First of all we were superlucky to meet Fabio Ricci from vonneumann/AOR that helped us a lot and actually made possible for us to print our first vinyl. Motherofallgoddessesblesshim. Then, we had a very good response from critics, and yes today everything’s changed, but that always helps, at least mentally speaking. In the end, we had a really long tour around Italy, that still proceeds, and we just came back from our first 8 gigs English tour, that was really unexpectedly amazing. People was wonderful with us, we met really lovely humans that we look forward to meet again soon, and most of all, this tour left us with the feeling we’d really be at the beginning of “something” important for us. So we just came back and we’re already working on new stuff for our second album. Born in Tuscany (Italy). She graduated with laude in aesthetic philosophy in Padua, actually lives and works in Cortona (Italy). Her artworks were exhibited in many galleries and international contemporary art museums and festivals in Italy and abroad, from the USA to Cambodia, from Mexico to Russia. She had several awards, including the First Prize for videoart at Romaeuropa Webfactory of Rome in 2009. Her education includes disciplines such as theater, dance, drawing, sculpture, music, photography that, in addition to their independent development, are also the elements she combines in a fusion of performance and video art.